Identify what the final clue is, and work backwards from there. You can use z.umn.edu to create a short URL that would lead students to a website. 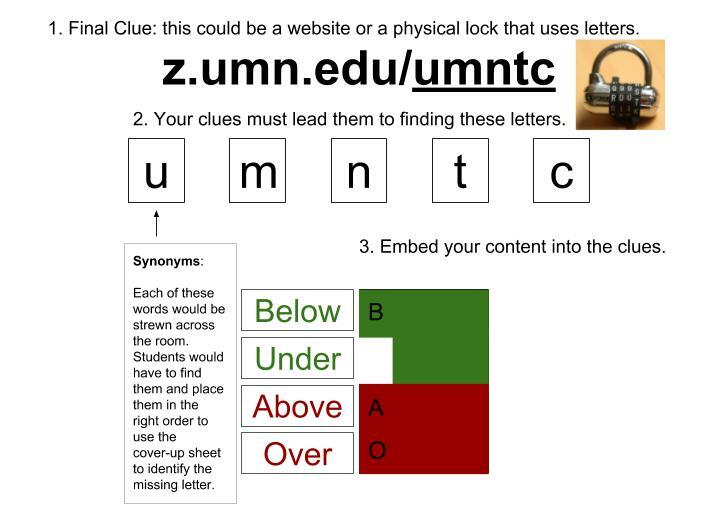 All clues students search for would help them complete the short URL and unlock that clue. Embed reviews of course content in the clues. Students answer review questions that would lead them to a clue if they answered them correctly. Students could also complete physical tasks to get clues. This is an opportunity to combine content knowledge with creativity. Set up a context for experience. For example, one instructor’s puzzle narrative was that each student had been implanted with a chip in their necks that would prevent them from leaving the room. In order to deactivate it, they needed to find a code to get them to a website that would deactivate the chip. Their instructor had strewn clues all around to help them. If you would like support in gamifying part of your curriculum, please don’t hesitate to contact the DEI staff.